Since writing my first post on how I earn gift cards using Swagbucks, my usage has come and gone in waves and I'm just now getting back into a regular routine. There are parts of the website that have undergone some changes in the past year-or-so (the survey dashboard, for instance) and I thought now would be a good time to share what I've learned! Because I hadn't been using the site daily since late last year, I thought that it would be smart to do a month-long experiment to see how much I could earn while putting in only the time I feel is sustainable in the long run (for me, that's 10-20 active minutes daily). And I was pretty thrilled to have earned $35 in gift cards last month—without that much effort, when I think about it. If I can maintain this pace (which I definitely feel is doable), I will have earned $420 one year from now. Before I dive in to the details of my daily Swagbucks routine, here's a little history! (That way you can have an idea of where I'm coming from when I wax poetic about this website.) I've been using Swagbucks for nearly 2 years (with months of doing nothing here and there, due to the general busyness of life!). In that time, I've earned $460 in gift cards. 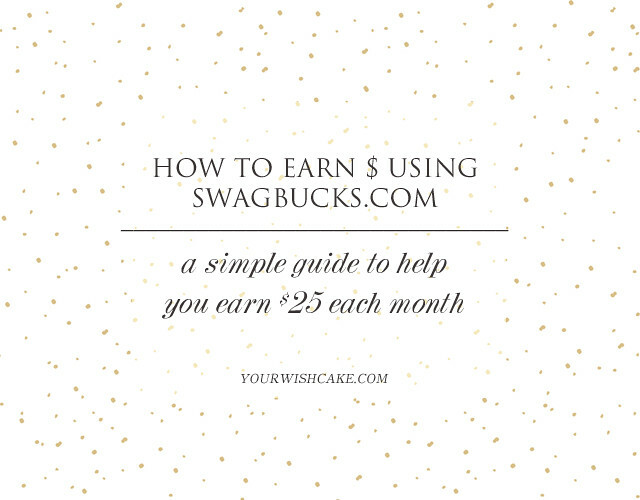 The vast majority of the Swagbucks I've earned have been through my own effort, although here and there I will receive a tiny boost from referrals. I intentionally wanted to use March as my test-month to see how much I could earn without the help of referrals, because I am currently receiving very little above my own daily earnings. My hope is always to fairly offer any advice I have to people who are just starting out! I'm sure there are bloggers out there who need to do very little each month, and still earn many gift cards each month, because you receive back 10% of the earnings from all your referrals (forever and ever, amen!). So, here is my best advice on how to earn at least $25 in gift cards every month! Even if that doesn't sound impressive to you, over the course of a year that is an extra $300. That could cover Christmas gifts, diapers and wipes (if you're a parent! ), or even groceries and household items you are able to purchase at a discount on Amazon. For spending as little as 10-20 minutes every day, I'd say it's totally worth the effort—whether you're a stay-at-home-mama, a busy student, or someone with a full-time desk job. Anyone can benefit from this site—of this, I'm convinced. These are the things I do every day—mostly in the morning before my daughter wakes up. If I don't hit a survey in the morning, I'll try again in the afternoon or evening after she is in bed. And the SBTV app I run every night after I go to bed, because it runs until the battery in my phone dies and I can earn Swagbucks, literally, in my sleep. On the left side of the main Swagbucks website, you'll find your "to-do list"—and I always complete the daily poll, Swagbutton, and NOSO. If I complete these every day for a month, I'll earn 124 SBs. I use the search engine for everything, even to direct me to websites I go to all the time (gmail, bookmarked blogs, Twitter, etc.). On average, I earn around 8 SBs every day. If used regularly, I earn around 250 SBs monthly. Surveys are found on the top menu, under the Answer tab. They recently redesigned this section, which I wasn't sold on at first, but last month I found that after I started qualifying, I could usually qualify for at least one almost every day. I never try for any surveys that take longer than 15 minutes (so I can stick to my daily time limit!) and very rarely shoot for any worth less than 50 SBs. I have the best luck with the ones that pay out 50-75 SBs and take between 10-15 minutes to complete. Be sure to complete the profile questions on the right side of the survey panel, which help them set you up with surveys that you have a better chance to qualify for! I try to complete 1 survey every day, averaging around 60 SBs. Although I can't imagine being able to complete 1 every single day (sometimes there just aren't any to qualify for! ), I'd say I can easily reach this goal 75% of the time. If I complete 1 survey every day for even 3 weeks out of the month, I'll earn around 1260 SBs monthly. SBTV is the Swagbucks app I use nightly, and is my favorite way to earn, because all I need to do is run it on my phone and it goes through short videos, earning me 2 SBs after every 4 videos. Because this app runs on its own, you don't need to monitor it to be earning anything—which is why I choose to run it every night when I know I won't be needing my phone. There is a limit of around 30 SBs you can earn every day using this app. But if you're able to hit the limit every day, the earnings will be 930 SBs monthly. I'm able to complete all the above daily tasks in less than 20 active minutes every day (and honestly, it's usually much less time than that). Doing these things alone will total 2564 SBs in one month. Because the first $25 gift card you claim each month costs only 2200 SBs, that means I will have earned $25 in gift cards, with 364 SBs leftover. And that's not counting any additional earnings that have come in through referrals, bonuses, or swag codes (more on this below). Kind of fantastic, yes? Here are a few other things I recommend trying in order to boost your earnings every month, or make up for not qualifying for many surveys (which I have heard can be an issue!). I actively use each of these things, but they aren't a part of my daily checklist, so they're not something I like to tally into what I know I can earn every month. On the left side of the main Swagbucks website, you'll find your daily goal for earnings. The following month, they will payout any bonuses you earned throughout that specific month. When I'm able to add an extra 100 SBs or so to my account in a month for doing nothing but reaching my goal when I can, I'm a happy gal. Swag Codes are bonus codes offered sporadically on social media. They don't offer them daily, and there's often no knowing when there will be one available, so I like to follow @swagcodezalertz on Twitter, because they automatically post the codes when they go live, so I have better luck entering them before they expire (typically within an hour)! These codes are entered on the right side of the top menu on the main Swagbucks website. Referrals, as I mentioned before, can definitely be a perk if you either have a large social network—or friends and family who become avid users. You will earn 10% of any SBs earned by those you refer, and there is no limit to how much you can earn. I want to also mention quickly that answering surveys through Swagbucks has let to a few other other opportunities that have been rather fantastic. Through one survey, I had the chance to join an online panel that gives me additional opportunities to leave feedback on products and is very generous with their compensation. With this particular panel, which is a community of moms, I have earned $80 in Amazon gift cards within the past year, and I'm not even required to interact with their site very often. Aside from that, I've completed surveys on numerous occasions that offered free diapers and wipes in return for completing a brief survey after using the products on my child. I've also completed many music surveys (hosted by radio stations), which eventually led to an opportunity to complete an extensive survey that paid out $90 once I completed it. Clearly, these aren't things that are guaranteed, but during the past two years of using Swagbucks, I've been pleasantly surprised (over and over). If you haven't signed up yet and would like to, feel free to use my referral link (but if you know of another blogger who you'd like to support, definitely reach out and ask them for theirs!). I feel like this took a million years to write, but I hope that it offers some help to those of you who are just starting out—or those of you who signed up ages ago and just didn't know where to begin. I know when I first signed up, I kind of had to figure it all out on my own, because I couldn't find any sort of guide that wasn't completely confusing to me. I honestly want to see other people benefit from using this site, so if you have any questions at all, feel free to ask away! I'd be more than happy to help and will answer any questions within the comments below. Let me know if you have any success earning this month (and beyond)!